Its that time again everyone! This is a combination of our 2.2 beta we pulled due to some various issues, and what we have been working on since. We went ahead and added an audio mixer! From here you can easily view all the audio sources you currently have live, adjust their volumes, mute a single source, change audio delay, remove a specific audio source from your monitor, and more! New! Added Audio Mixer to Gameshow. New! Added Shot Layer Mattes (Image Masking) to Gameshow. And various bug fixes. See release notes for more details. Nope, just audio sources in windows. Would be nice to see a per app audio capture tho, that would be a killer feature worth paying for! 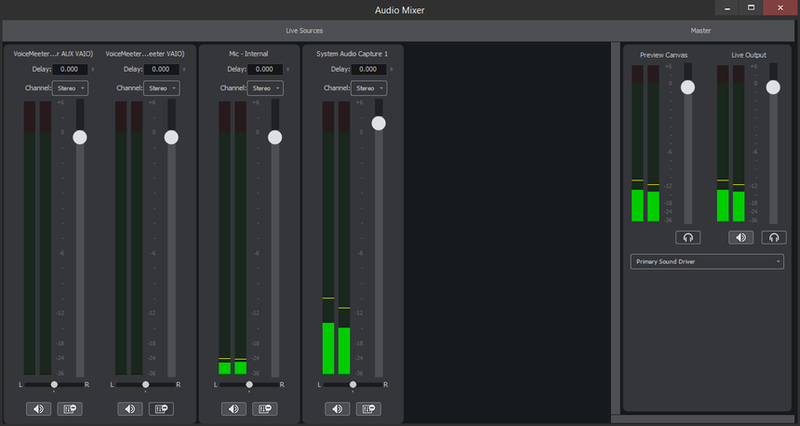 You can do that in windows tho, just pull up the audio mixer, everything in there shows up in the Desktop audio. If the capture software had that too I could listen to music I wanted while the stream is doing music requests, or have no music at all. Yup. I said is it a hint; not a hidden feature.